Chintan is a founder of RPCK, a global boutique law firm focused on helping investors and entrepreneurs get complicated deals done in an efficient manner. He counsels private equity, foundation, family office and growth company clients on a wide variety of corporate, M&A, finance, and dispute resolution matters. 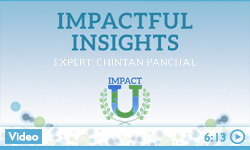 Chintan is also head of the firm’s Impact Investing practice. Chintan advises clients on all major aspects of private investment fund and portfolio company growth and development, from formation to developing and protecting assets to negotiating agreements with business partners, to fund raising and exit. Chintan has diverse experience representing a variety of clients and, as an entrepreneur, is well-versed in the challenges facing growing companies. He is passionate about helping impact investors and social entrepreneurs achieve double and triple bottom line results.